Finland is often referred to as one of the Scandinavian countries but whether it actually is is a debatable matter. According to Wikipedia Scandinavia is an area with similar or mutual language, cultural history and location, and therefore it consists of Sweden, Norway, Denmark and in some contexts also Iceland and even Faroe Islands. The concept of Scandinavian countries is however vague and nowadays the name is often used as a synonym for the Nordic Countries. But what differentiates us from our neighbors and makes us Finns? If you listen to a Finnish person speaking his/her native language and compare it to a Swede the difference here is pretty obvious. Where Swedes and Norwegians can understand each other without a problem no one can understand Finnish, even us Finns find it sometimes difficult to understand some dialects (Rauma I am talking about you). The formal, standard Finnish doesn’t have much to do with the spoken language which can make the language learning process frustrating for a foreigner. I guess we can all agree that the language is rather useless on a global perspective, but we are proud of it nevertheless. Once you get over the language barrier other aspects of the culture arise. Finns are genetically distinct from other Europeans (Gates, 43, 2014) which is a fact (though a debatable one…) we like because we don’t like to get mixed up with other Nordic countries (particularly Sweden) and have a strong sense of national identity, probably because Finland has been under either Russia’s or Sweden’s rule for centuries. Where Swedes are jolly people who have a gay old time on the other side of the Gulf of Bothnia, Finnish people are, generally speaking, somewhat introverted, insecure and melancholic. On the eyes of a Finn Swedes always seem to be luckier than Finns, however we would never switch places with them. But there is more to Finnish people than you first might think; we are also perseverant, honest (one of the most important values in Finland) and trustworthy. Finnish people don’t want to make a big deal out of themselves and enjoy a big personal space but once you get to know us you will probably find more layers and be surprised by the fact that we actually can hold a conversation and show emotions when appropriate. Our friendships have to be earned which in my opinion makes it more valuable and Finnish people are very loyal to their family and friends. What I feel about Finnishness is that we are very honest and because of that in Finland you can expect things to go smoothly. We are also very calm and maybe a little more quiet than people from other countries and we like our personal space. We enjoy spending time in groups but also alone. Personally I think that we like to separate our time at home and time out too much. For example the nearest café-house or bar doesn’t feel like a living room to us. One recognizable thing in us Finns is that we don’t like to speak formally. And the use of those many formal polite words doesn’t come naturally to us. Words like “Mister” or “Sir” are not in a great use and we do not have a word for “please”. I think that we might seem rude to foreigners from time to time but the thing is, we don’t mean to. When we face each other we are polite by our appearance and we understand each other’s behavior based on speaking tone. So when we interact we have this common understanding of what is good behavior. Some might even say that we have great non-verbal communication skills. We are also very humble. In some ways that is a very good feature. For example we don’t like to interrupt others speech, that makes us good listeners and polite in a way. But also our humbleness has its negative sides. When a Finnish person takes pride and glory in something it’s not in-common that others see it as a bad thing. I think we should be more proud of our achievements and ourselves. At first sight Finns seem shy, because they do not usually talk to strangers, and they do not take an eye contact. But when you get to know them better, they are really friendly and considerate. Punctuality and honestly are characteristics that are often associated with Finns. Finns are known nature loving people. In Finland, nature is never far away and Finns have a close connection with it. Getting away from cities and walking in the woods is a simple way for collecting your thoughts. Finns loves sauna. Saunas have also existed in other countries, but in Finland that have become a part of the national culture. For me personally one of the most distinctive characteristics of a Finn is honesty. In Finland dishonesty is considered shameful, and when doing business or even just in our daily lives, we take a lot of pride in being honest. That is one of the few traits of a conventional Finn I recognize in myself. While being abroad or at home, I would almost consider it a personal insult if someone were for example to try and trick me into paying too much money for something. The Finnish saying “rehellisyys maan perii” (literal translation: honesty inherits the land), insinuates that honesty is a trait that will eventually bring success or good fortune, and if one were to cheat, nothing good were to follow in the end. Finnish people have a strong sense of conscience which dictates quite heavily how our society works. We have rules and laws for everything, and even if they might not always seem reasonable, Finns have a lot of respect for authorities. Another trait often used to describe Finns is Sisu, which means that undefined something that makes us push through in difficult situations. Perhaps it has something to do with our geographical location and therefore cold winters and long nights, or perhaps it is that our country is quite sparsely inhabited, but Finns have resilient natures. In practice it means that we do not give up, but do whatever is required from us. “Läpi harmaan kiven” (literally: through the grey rock) is another saying that describes the mindset quite well. It has sort of a “mind over matter” meaning, achieving something against all odds. We take pride in being able to stand with our own two feet, surviving. Sometimes this can cause trouble since Finns might have difficulties asking for help even when they should, since we take so much pride in coping alone, with pure sisu. Probably the best (and easiest) way for me to describe Finnishness is to describe Finn’s mentality through stereotypes and values Finn’s appreciate. Usually Finns are characterized as a shyish and quiet people, but that’s only part of the truth. Most Finns are modest, polite, honest and little abstained. Politeness is usually shown by actions and behavior instead of saying and small-talking is not a thing here. 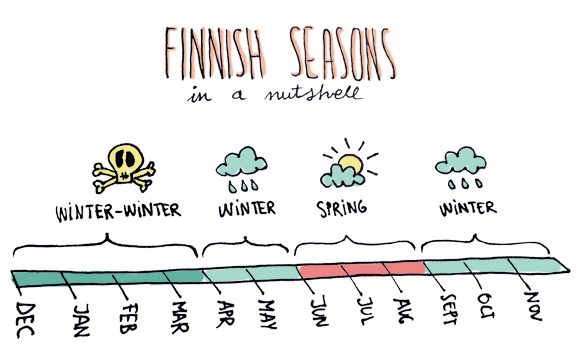 I think one of the biggest factor that effects people’s mentality and attitude towards other in Finland is seasons: During those tiring dark seasons people usually like to spend time alone and are not so social, and on the bright seasons people wake up again, and are more outgoing and social. Most of the year is dark, so we make the most of these few bright months. Perhaps the grumpy and quiet Finn-stereotypes comes from people’s mentality during winter months. Finnish people usually value nature greatly, and that’s why there is about 500,000 summer cottages and thousands of square kilometers of national parks here. Traditionally one of the biggest holidays, midsummer (Juhannus), is celebrated in summer cottages. During midsummer people head out to country to relax, go to sauna, eat and drink well and watch bonfire. Summer cottage is usually percieved as a place to “escape” living in cities, and to relax in the nature for a while.